Now in the fifth decade of an illustrious international career, Misha Dichter traces his musical heritage to the two great pianistic traditions of the 20th century: the Russian Romantic School as personified by Rosina Lhevinne, his mentor at The Juilliard School, and the German Classical style that was passed on to him by Aube Tzerko, a pupil of Artur Schnabel. Mr. Dichter reveals this dual legacy in his solo recitals and appearances with virtually all of the world’s major orchestras, performing the grand virtuoso compositions of Liszt, Rachmaninoff and Tchaikovsky, as well as music from the central German-Viennese repertoire–works by Mozart, Beethoven, Schubert, and Brahms–which embody more introspective qualities. Mr. Dichter’s acclaimed recordings for Philips, RCA, MusicMasters, and Koch Classics further illustrate his musical interests. They include the Brahms piano concerti with Kurt Masur and the Leipzig Gewandhaus Orchestra, Brahms solo works including the Handel Variations, Beethoven piano sonatas, the complete Liszt Hungarian Rhapsodies, the Liszt Piano Concerti with André Previn and the Pittsburgh Symphony, and Gershwin’s Rhapsody in Blue with Neville Marriner and the Philharmonia Orchestra, as well as music of Chopin, Mussorgsky, Schubert, Schumann, Stravinsky, and Tchaikovsky. Fanfare called Mr. Dichter’s recording of Stravinsky’s Piano Concerto conducted by Robert Craft “one of the few really important Stravinsky discs to come out in recent years.” A noted exponent of Liszt’s piano works and a champion of the composer’s forward-looking contributions to the development of music, Mr. Dichter was honored in 1998 with the “Grand Prix International du Disque Liszt,” presented for his Phillips recording of Liszt piano transcriptions. An active chamber musician, in addition, Mr. Dichter has collaborated with most of the world’s finest string players and frequently performs with Cipa Dichter in duo-piano recitals and concerto performances throughout North America and in Europe, as well as top summer music festivals in the U.S., such as Ravinia, Caramoor, Mostly Mozart, and the Aspen Music Festival. They have brought to the concert stage many previously neglected works of the two-piano and piano-four-hand repertoires, including the world premiere of Robert Starer’s Concerto for Two Pianos, the world premiere of the first movement of Shostakovich’s two-piano version of Symphony No. 13 (Babi Yar), and the world premiere of Mendelssohn’s unpublished Songs Without Words, Op. 62 and 67 for piano four hands. Mr. Dichter’s master classes at music festivals and at such conservatories and universities as Juilliard, Curtis, Eastman, Yale, Harvard, and the Amsterdam Conservatory, are widely attended. Mr. Dichter was born in Shanghai in 1945, his Polish parents having fled Poland at the outbreak of World War II. He moved with his family to Los Angeles at the age of two and began piano lessons four years later. In addition to his keyboard studies with Aube Tzerko, which established the concentrated practice regimen and the intensive approach to musical analysis that he follows to this day, Mr. Dichter studied composition and analysis with Leonard Stein, a disciple of Arnold Schoenberg. He subsequently came to New York to work with Mme. Lhevinne at The Juilliard School. At the age of 20, while still enrolled at Juilliard, he entered the 1966 Tchaikovsky Competition in Moscow, where his choice of repertoire—music of Schubert and Beethoven, Rachmaninoff and Stravinsky—reflected the two major influences on his musical development. Mr. Dichter’s stunning triumph at that competition launched his international career. Almost immediately thereafter, he performed Tchaikovsky’s Piano Concerto No. 1 at Tanglewood with Erich Leinsdorf and the Boston Symphony, a concert that was nationally broadcast live on NBC and subsequently recorded for RCA. In 1968, Mr. Dichter made his debut with Leonard Bernstein and the New York Philharmonic, performing this same concerto. Appearances with leading European ensembles, including the Berlin Philharmonic, Concertgebouw of Amsterdam, and the principal London orchestras, as well as regular performances with major American orchestras, soon followed. An accomplished writer, Mr. Dichter has contributed many articles to leading publications, including The New York Times. He has been seen frequently on national television and was the subject of an hour-long European television documentary. Mr. Dichter is also an avid tennis player and jogger, as well as a talented sketch artist. His drawings, which have served as a sort of visual diary, have been exhibited in New York art galleries. 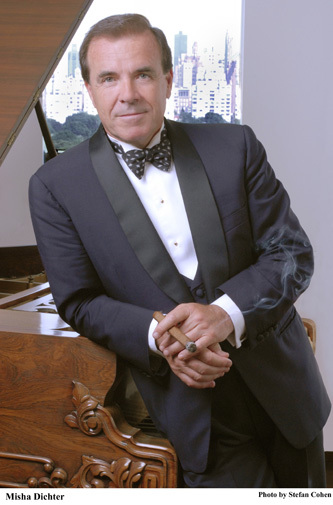 Mr. Dichter lives with his wife, pianist Cipa Dichter, in New York City. They have two grown sons. For the fiftieth anniversary of the Boston Symphony in 1931 Serge Koussevitzky commissioned major works from a host of prominent composers, including Stravinsky, Hindemith, Roussel, Honegger, Prokofiev, Respighi, Copland, and Hanson. Hanson’s contribution, the Romantic Symphony, was premiered by Koussevitzky and the Boston Symphony on November 28, 1930, and has become his signature piece. Howard Hanson is typically mentioned in the same breath with the Eastman School of Music, where he was hired as director at the tender age of twenty-seven by George Eastman of Kodak fame He brought the school to international prominence during his forty-year tenure in that position. Hanson was also known as an unflagging champion of American music, conducting premieres of works of such illustrious American composers as Samuel Barber, Elliott Carter, Aaron Copland, David Diamond, Alan Hovhaness, Wallingford Riegger, Roger Sessions, and Virgil Thomson, and reviving works by earlier American composers including George Whitefield Chadwick, Arthur Foote, Charles Tomlinson Griffes, Charles Ives, Edward MacDowell, and John Knowles Paine. As a composer he is primarily known for his six symphonies, though he produced a large number of choral works, chamber music, and music for the stage, including his opera Merry Mount, commissioned by the Metropolitan Opera in 1933. His Scandinavian roots greatly influenced his harmonic style—he often cited Sibelius and Grieg in particular as key influences. For his orchestration techniques, which show a mastery of varied instrumental colors, he gave chief credit to Respighi, with whom he studied for several years as a recipient of the Prix de Rome. Hanson labeled his Second Symphony “Romantic”; in the note for its Boston premiere he wrote: “My aim in this Symphony has been to create a work young in spirit, Romantic in temperament, and simple and direct in expression.” The three-movement work forgoes the scherzo movement of a traditional symphony and is heavily weighted toward the first movement, both in length (almost twice that of the other two movements combined) and in treatment of musical materials. The opening slow introduction, as might be expected, furnishes many of the basic ideas for the entire Symphony. The most salient features of the sonata-allegro movement are the main theme—a kind of descending fanfare with its signature harmony, a lyrical episodic theme begun by oboe, and the quiet secondary theme—actually two melodies, one for strings and one for solo horn. All of these reappear in various guises. The tender theme of the slow movement is probably Hanson’s most famous; it was even appropriated for radio and television themes. A brass interlude follows, based on material from the first movement introduction. The broad secondary theme subsides into a restatement of the opening. Fanfare seems to describe the effect of the final movement, which serves as a compendium of the entire Symphony. The opening figure is derived from the first movement, as is the principal theme with its characteristic dotted rhythms. The main and secondary subjects of the first movement are recalled at the climax, and at the very end of the movement, the slow movement’s tender theme is brought back, now proclaimed fortissimo by the brass. Though the scenario was formulated one year after the completion of the work, Rachmaninoff scholar Barrie Martyn has made a convincing case for the composer having had a Paganini story in mind all along. Such a story may have prompted him to weave the Dies irae (medieval sequence from the Mass for the Dead) into several of the variations. Rachmaninoff’s unexplained obsession with the Dies irae manifested itself frequently in his compositions, though he always quoted only its opening phrase. Rachmaninoff premiered the Paganini Rhapsody with Leopold Stokowski and the Philadelphia Orchestra in Baltimore on November 7, 1934, and soon played it throughout the United States and Europe. It won instant popularity, owing in large measure to the glorious eighteenth variation, which has since been taken out of context frequently and used for radio, television, and movie themes. Critical reaction to the work was mixed, but since that time, far from fading into oblivion in the way of other “virtuoso-music” and “fluff,” the Paganini Rhapsody has secured an even stronger place in the repertory, along with several of Rachmaninoff’s concertos and symphonies. The Paganini theme, from his Caprice No. 24 in A minor for solo violin, has cried out for variation from the start. Paganini himself was the first to subject it to variation treatment in that Caprice; Schumann, Liszt, and Brahms all made their contributions. Nor was Rachmaninoff the last—Witold Lutosławski and Boris Blacher, and popular composers such as John Dankworth and Andrew Lloyd Webber have all been attracted to it. Rachmaninoff’s structural design for the Rhapsody falls naturally into three sections corresponding to the movements of a concerto: opening movement, Variations 1–10; cadenza-like transition, Variation 11; slow movement, Variations 12–18; and finale, Variations 19–24. One thinks of Beethoven in regard to Rachmaninoff’s stern eight-bar introduction and detached-note first variation, which precedes the presentation of the theme, in the manner of Beethoven’s Eroica finale. The Dies irae makes its first appearance in Variation 7, where Rachmaninoff envisioned “a dialogue with Paganini, when his theme appears alongside Dies irae.” After Variation 10, in which the Dies irae returns, a wonderful change of mood is ushered in by the “cadenza” of No. 11. The “slow movement” variations, in a variety of keys other than the home key of A minor, include: a minuet (12), a march-like variation (13), a major-key variation with the first suggestion of the theme inverted (14), a scherzando variation full of pianistic dazzle (15), a delicately scored, shimmering variation (16), a dark variation in B-flat minor (17), and the radiant eighteenth variation. The lush melody of No. 18 is based on an inversion of the Paganini theme, yet Martyn has pointed out that it also bears a certain resemblance to the slow movement of Nikolai Medtner’s Sonata-Fairy-Tale, which Rachmaninoff sometimes played in concert. The last group of variations returns to the home key of A minor, increasing in pianistic brilliance through the final variation. In Variations 19 and 24 one is struck by the references to aspects of Paganini’s legendary violin technique. Variations 22 and 24 bring back the Dies irae. The dazzling final variation ends with two tossed-off measures approached by a difficult leap, which apparently caused problems even for the composer. According to a charming story often told by Benno Moiseiwitsch, a glass of crème de menthe provided the solution for hitting the right notes for Rachmaninoff, who never drank as a rule. The Rhapsody’s witty ending after all that has gone before provides a rare glimpse of Rachmaninoff’s sense of humor.